Breakfast can be a simple, elegant affair at the UCLC Conference Center, or it can simply be elegant. 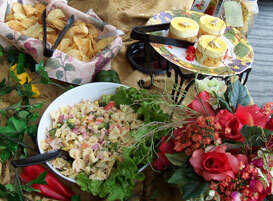 We offer a wide variety of breakfast menus, and would be happy to customize especially for your event. The Amore Strata selection menu starts with a delightful strata made from farm fresh eggs and your choice of fillings, including ham and swiss with mushrooms, garden vegetable or hearty sausage with onion and red pepper. For the Quiche Breakfast, choose from a variety of delicious quiches, including asparagus and sun-dried tomato, sausage and red pepper or ham and cheddar cheese. The Country Breakfast has something for everyone, from freshly scrambled eggs to crisp Virginia bacon to skillet potatoes, fresh fruit, bagels and much more. 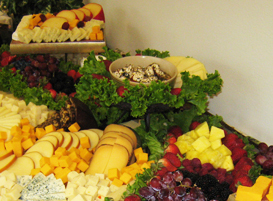 And for a special touch, try our made-to-order omelette stations for your next event. Whatever you can think of, we probably can offer it - and often do. Try our signature cherry and apple strudel or our old-fashioned cinnamon rolls for your next event.